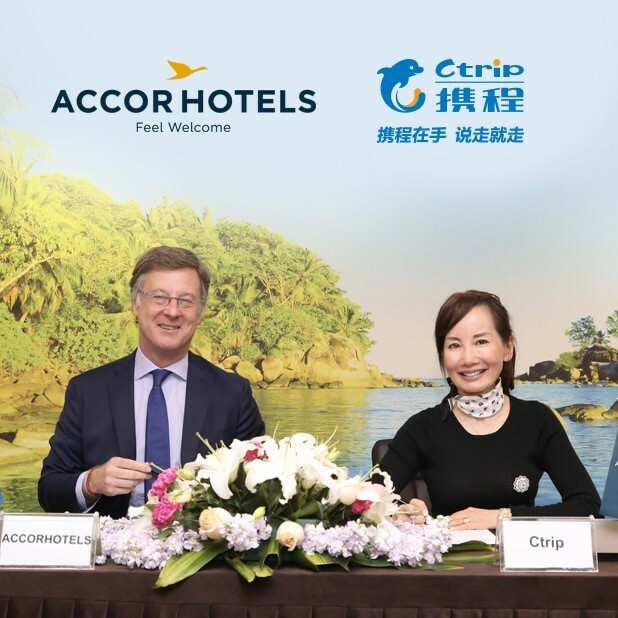 Ctrip.com International, Ltd. (Nasdaq: CTRP), a leading provider of accommodation reservation, transportation ticketing, package tour and corporate travel management and other travel-related services in China (“Ctrip”), announced that it has entered into a memorandum of understanding regarding its partnership with world-leading travel & lifestyle group and digital innovator AccorHotels. The partnership will allow Ctrip’s over 300 million registered users to access and enjoy personalized experiences from AccorHotels’ global brands portfolio, ranging from internationally acclaimed luxury brands -including Raffles, Sofitel Legend, Fairmont, SO/, Sofitel, onefinestay, MGallery by Sofitel, Pullman, Swissôtel and 25hours Hotels- as well as the popular midscale brands Novotel, Mercure, Mama Shelter and Adagio- to the much-prized economy brands including JO&JOE, ibis, ibis Styles, ibis budget and the regional brands Grand Mercure, The Sebel and hotelF1. AccorHotels operates 4,300 hotels and 10,000 private homes in 100 countries. The MOU is a milestone for both companies to embark on a deeper cooperation which will greatly enhance the growing Chinese travelers’ journey globally. The partnership will focus on four strategic pillars, including highlighting AccorHotels accredited hotels more prominently, building a flagship store for AccorHotels, joint development of loyalty programs and cooperation on IT. “As China’s preeminent travel agency, Ctrip, with its over 300 million registered users is definitely a strategic partner of AccorHotels in the region,” concludes Sebastien Bazin. AccorHotels is a world-leading travel & lifestyle group and digital innovator offering unique experiences in more than 4,300 hotels, resorts and residences, as well as in over 10,000 of the finest private homes around the globe. Benefiting from dual expertise as an investor and operator, AccorHotels operates in 100 countries. Its portfolio includes internationally renowned luxury brands such as Raffles, Sofitel Legend, SO/, Sofitel, Fairmont, onefinestay, MGallery by Sofitel, Pullman and Swissôtel, the mid-range boutique hotel brands 25hours, Novotel, Mercure, Mama Shelter and Adagio, and very popular budget brands such as JO&JOE, ibis, ibis Styles and ibis budget, as well as the regional brands Grand Mercure, The Sebel and hotelF1. AccorHotels provides innovative end-to-end services across the entire traveler experience, notably through the acquisition of John Paul, world leader in concierge services.